Oxalic acid-based treatments for midwinter Varroa control are most effective when colonies are broodless†. This is because oxalic acid (OA) treatments only kill phoretic mites and are ineffective against mites in sealed cells. They are therefore ideal for use on swarms, packages and broodless colonies in midwinter. These OA treatments include Api-Bioxal, the VMD-approved treatment, and unmodified oxalic acid, it’s active ingredient. 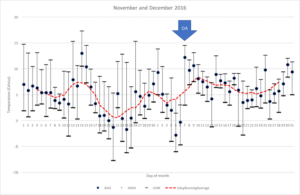 The importance of midwinter treatments, the preparation of the OA solution and how to trickle treat have recently been covered. I’ve previously discussed sublimation and will do so again in a longer article in the future. How can you tell whether your colonies are broodless in midwinter? On a warm, sunny, Spring afternoon this takes just a couple of minutes … remove the roof, crack off the crownboard, gently lift out the dummy board and the adjacent frame, look carefully at the mass of bees covering the top bars, aim for about the middle and gently prise apart those two frames, lift out a frame from one side of the ‘gap’ and – Hey presto – brood. Actually, you can do exactly the same in midwinter. There are videos on the internet showing an experienced and (in)famous Finnish beekeeper opening his colonies at -10ºC. I’ve opened and briefly inspected colonies at low temperatures (though not sub-zero). The bees are usually pretty torpid, reluctant to fly – or simply too cold to – and you can be in and out in just a minute or so. Bees cope pretty well with this. It undoubtedly disturbs them a bit and it breaks the propolis seal on the crownboard, but – done carefully and quickly – it’s the only foolproof way to determine whether a colony is broodless in midwinter. But what if they’ve got brood and it’s therefore not the optimal time to treat? Do you go back and repeat the entire process in 1-2 weeks? What if it’s snowing next time, or there’s a howling gale blowing? An alternative approach is needed∞. As the colony moves from summer to autumn the egg laying rate of the queen drops. It goes on dropping, although not necessarily smoothly, as the days shorten further, the temperature drops and the sources of pollen and nectar disappear. If the queen stops laying altogether then the colony will become broodless about 21 days later. At some point, perhaps early in the New Year, the queen starts laying again. Slowly at first, but at increasing levels as the season starts. Once foraging starts in earnest the egg laying rate increases markedly and peaks sometime in June. The precise timing of all these changes cannot be predicted. 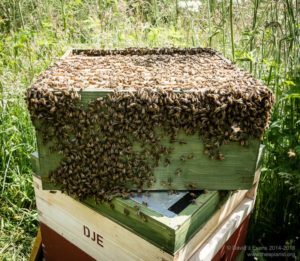 It’s likely to be dependent on a range of factors – nectar and pollen availability, the strain of bee, day length (and whether it’s increasing or decreasing) and temperature. Of these, temperature probably has the greatest influence. 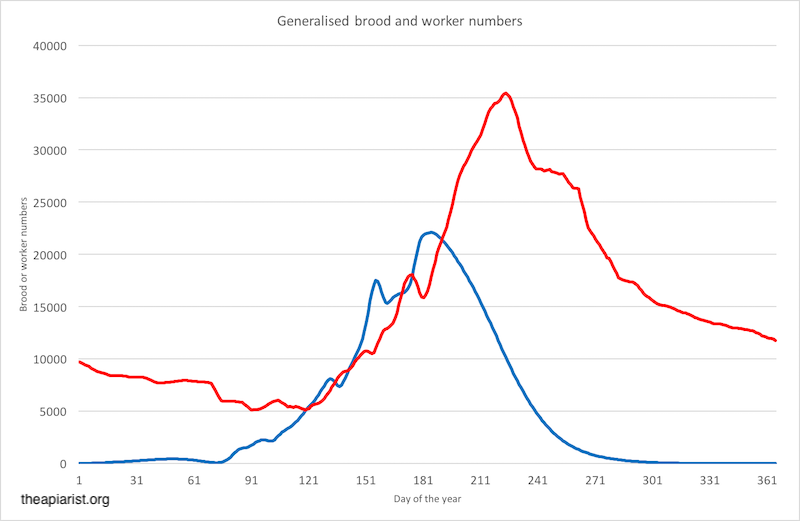 Here’s a quick’n’dirty graph put together with BEEHAVE showing a generalised annual cycle of total brood (blue) and adult bee (red) numbers. Under the conditions in this model the colony is broodless for ~30 days at the end if the year. Part of the problem with being definitive about the annual brood cycle is the temperature variation with latitude. Temperate regions stretch – in Europe – from Northern Finland to Southern Spain. Bees are kept throughout this range, but obviously experience wildly different climates. And then there’s the year to year variation. 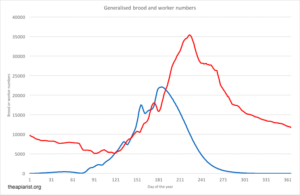 So if you can’t predict when the colony is going to be broodless, perhaps you can observe the weather – and in particular the temperature – and make an educated guess. 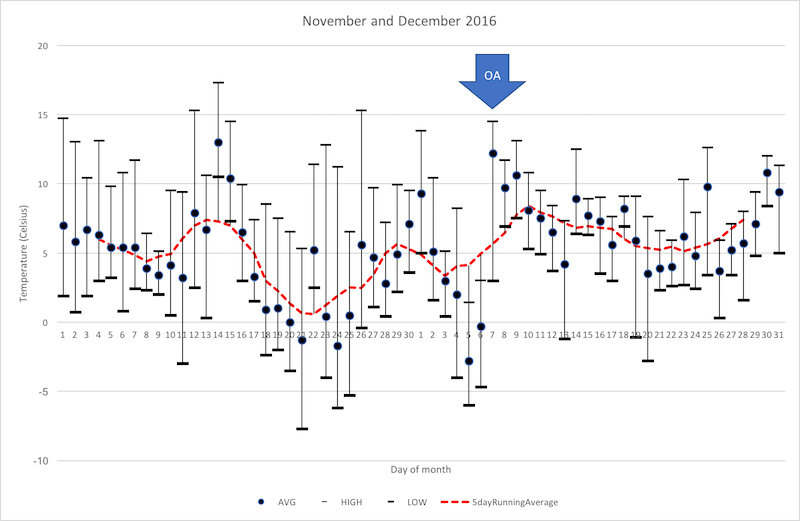 Over the last few years I’ve applied my midwinter treatment soon (<6 days) after the end of the first extended cold period of the season. This is generally earlier than most beekeepers, who often treat between Christmas and New Year, or early in January. 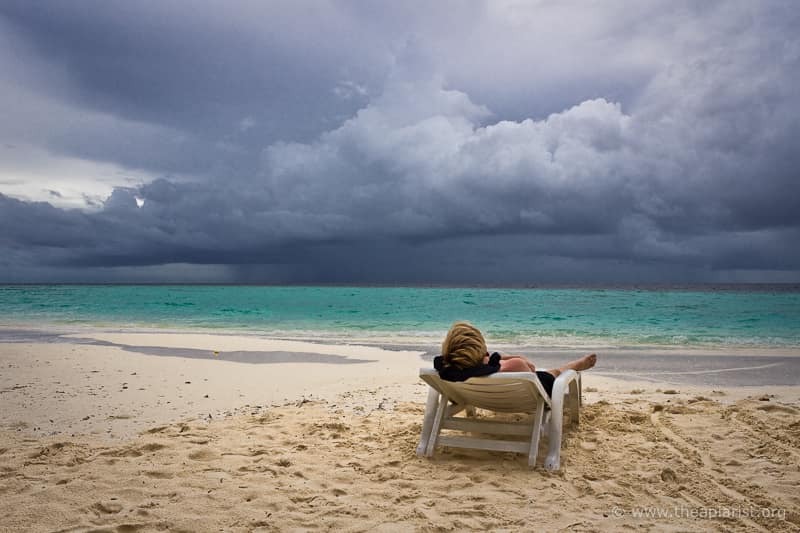 So, how do we reasonably accurately monitor the weather for a suitable time to treat? 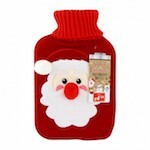 Most of us live in centrally-heated splendour, protected from the day-to-variation of temperature by heated car seats, air conditioning, hot water bottles, Thinsulate and wood-burning stoves. Do you know what the temperature was today? Rather than trust the wildly-variable (in accuracy) national‡ weather reports for the actual temperature near my apiaries, I instead use very much more local data from Weather Underground. There are hundreds of ‘amateur’ weather stations across the country that upload data to wunderground.com. Most of these provide current and historic data, including temperature (max, min and average). Here’s one for Auchtermuchty in Fife (on wunderground.com) and directly from the weather station. Once the weather cools I keep an eye on the average temperature over an extended period of a fortnight or so. If it remains low I wait a bit more … but I then treat as soon as practical after it warms up to 8-10°C or so. Here’s a graph of the temperature data for 2016§. As indicated on the graph, I treated colonies on the 7th of December. I didn’t open my colonies, but others opened on the same day nearby were all broodless. The 7th was chosen as it was the first warm (relatively!) day after a 19 day window in which the average temperature had barely climbed above 5°C. These treated colonies went into the New Year with vanishingly low Varroa levels. … by the light of a head torch, in light rain and strengthening wing at 7pm after work. It was over 11°C in the apiary when I treated, the barometer was plummeting and the forecast was for near-zero temperatures within 24 hours and remaining that way for another 10 days. Some of my hives have perspex crownboards. These allow me to check both the state of the colony and if the vapour from my Sublimox has permeated to every corner of the hive. All the colonies were very loosely clustered, with a few bees even wandering out briefly onto the landing board in the dark as I bumbled around preparing things. The Varroa trays will now be checked in a week or so to work out the mite infestation levels. In the meantime, I can start planning for the coming season knowing I’ve done the best I can to reduce virus levels in the colonies, so giving them a good start to the year. Colonies rearing brood maintain a higher, and stable, broodnest temperature (32-35°C) than colonies without brood. It is therefore possible to determine whether a colony has brood by monitoring the temperature directly, rather than trying to infer it from the ambient temperature. Arnia make hive monitors that allow this sort of thing to be measured. It would be interesting to relate the brood temperature to the ambient temperature (described above) to determine how accurate or otherwise simply ‘watching the weather’ is. Of course … what you’d really want to do is monitor when brood rearing stops and treat soon after that. I treated colonies in our research apiary the following day – the 7th – with dribbled Api-Bioxal. The temperature had dropped almost 7°C since the previous evening and colonies were again beginning to cluster tightly. Under these conditions I’m never confident that the OA vapour penetrates fully, so prefer to trickle treat. I briefly checked one strong colony in a poly hive for brood. Of course, this doesn’t guarantee all the others are also broodless, but it does give me some confidence that I’d chosen the correct weather to treat. † This article, like most on this site, discuss beekeeping issues relevant to temperate climates. It’s important to make this clear now as most of what follows is irrelevant to readers from warmer regions. ∞ Even if there is brood in midwinter, it’s going to be in pretty small amounts. The rate at which this brood emerges is going to be low. The chances of determining what’s going in the colony by ‘reading the tea leaves’ from the debris falling through the mesh floor of the hive is therefore not great. It would probably also require repeated visits to the apiary. 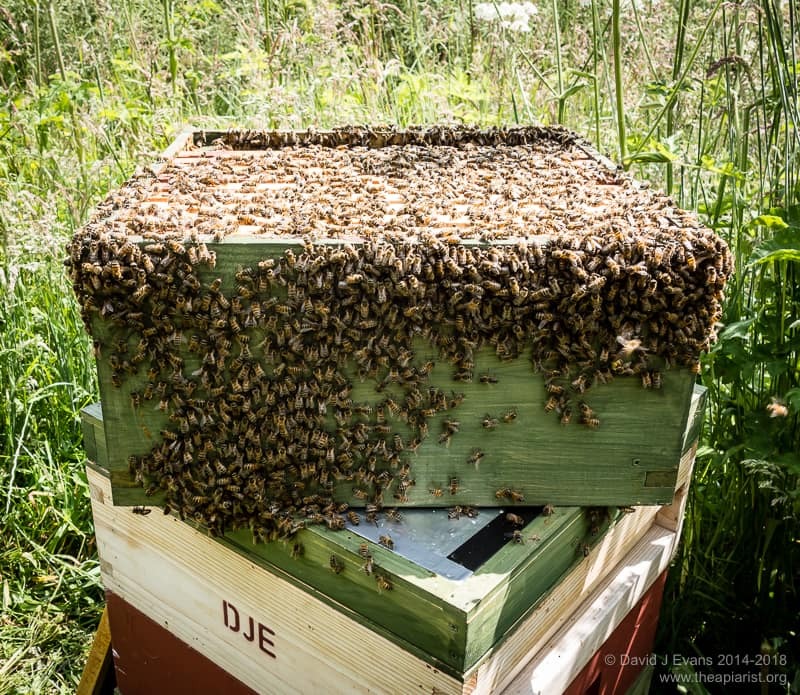 ß This needs qualifying … in midseason, when the temperature varies but it’s not generally cold, the nectar flow is probably the rate-limiting step for brood rearing. The June gap is regularly associated with the queen shutting up shop for a while. However, in late autumn and early winter I’m sure the plummeting temperatures is a major influence on egg laying by the queen. ‡ National … Ha! Most are only national if you live within the M25. Anywhere else and you’re usually much better off accessing some data from closer to home. It’s worth noting that the sort of ‘amateur’ weather stations I discuss do vary in data quality. For example, they’re a bit dodgy recording temperatures in full sun (they tend to over-read). However, if you find a local one, check the temperature in comparison to a thermometer in your apiary, you’ll find it’s a useful way to monitor what might be happening in the hives. § I don’t routinely generate these graphs – I have a life (!) – but did specifically to illustrate this post. It’s sufficient to simply monitor the average temperature. This entry was posted in Beekeeping, Varroa control and tagged Arnia, BEEHAVE, brood, broodless, mites, OA, oxalic acid, sublimox, temperature, Varroa, weather, whether, winter, wunderground.com on December 8, 2017 by David. This is so useful, I’m off out to do mine tomorrow! Also I wanted to say that as a relatively novice beek, I’m loving your site! Everything is informative and also current and up-to-date. Having a science background myself I like to see some logic applied, rather than the ‘folklore’ which you sometimes get. You give us the benfit of your advice and experience with humour and more importantly, not in a ‘preachy’ way! This is much appreciated. It’s always good to get feedback, particularly when posts here have been useful to others. Beekeeping is a broad church (don’t worry, I’m not going to get preachy!) and people start – and stop – for a variety of reasons. Many appreciate the underlying science which, as our understanding improves, should become an integral part of the training new beekeepers receive. Unfortunately, some of this teaching remains delivered by those steeped in ‘folklore’. This site tries to help. Done properly, beekeeping isn’t difficult. Of course, some people like to make it seem difficult 😉 Enjoy your early beekeeping and don’t stop trying to learn. I still look back on the many mistakes I’ve made – and continue to make – and hopefully continue to learn. Trying to figure out the best temperature to apply an Oxalic acid drip. I’m nervous about applying an oxalic drip when the temperature approaches freezing because I’ve only read about moisture causing mortality for bees. Dripping water based oxalic acid solution onto the cluster seems counterintuitive. At the same time, if I wait for a warm winter day my bees typically aren’t clustered and are busy cleaning the hive and I’m concerned I’m missing lots of bees. Any thoughts on an ideal temperature to treat with an oxalic acid drip? I’ve written extensively about this previously. I pre-warm the OA solution. I don’t know what the ‘ideal’ temperature is, but 3-5oC shouldn’t be a problem. Does moisture cause mortality? Really? How humid is the inside of a hive? The humidity monitor in one of my hives is currently reading 75% saturated. Dribbled/trickled OA has been used for decades very successfully. Despite the current fad for sublimation it has lots to offer … faster, well tolerated if used once on broodless colonies, no special equipment, pretty safe for everyone involved (no PPE). Remember that trickled OA does damage unsealed brood … all the more reason to choose a broodless period.